This cool and refreshing mint drink recipe is for a traditional non-alcoholic mint punch made from fresh mint leaves, grape and lemon juice and ginger ale. Fresh mint leaves make the tastiest mint punch. This mint drink recipe is super easy and quick. Your friends and family will be asking for more! 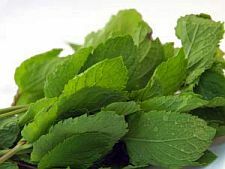 Harvest a quart of fresh spearmint or mint leaves. Wash with cool water and dry using a clean kitchen towel. Put the peppermint leaves in a glass jar that can withstand boiling water. Mash the leaves with a wooden spoon until they are soft. Pour boiling water over the leaves and allow to infuse for 10 minutes. Strain out the leaves and refrigerate. Once the mint drink mixture has cooled, add two cups of grape juice and lemon juice to taste. Sweeten with sugar and then add a quart of ginger ale. Serve your mint punch on ice with a sprig of mint leaves for a garnish.